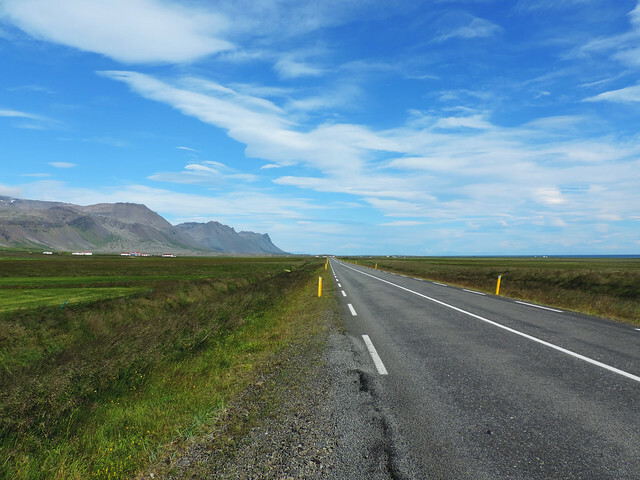 When it’s about Iceland and road trips most people think of the Ring Road. It runs around Iceland (not surprisingly) and it rewards with amazing scenery all the way. Though it’s the longest and most comprehensive scenic drive in the country, it’s not the only one. The land of fire and ice and countless other natural beauties offers quite some spectacular scenic drives. Like Road 54 around Snæfellsnes Peninsula. 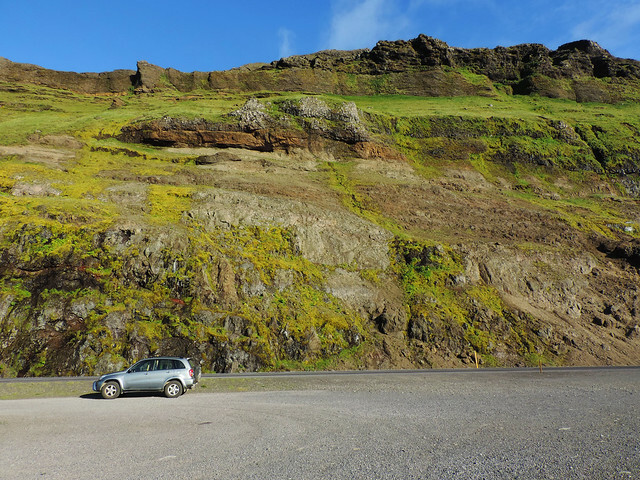 Click here for car rental deals and more info about driving in Iceland! “Iceland is the world in miniature” – goes the saying. 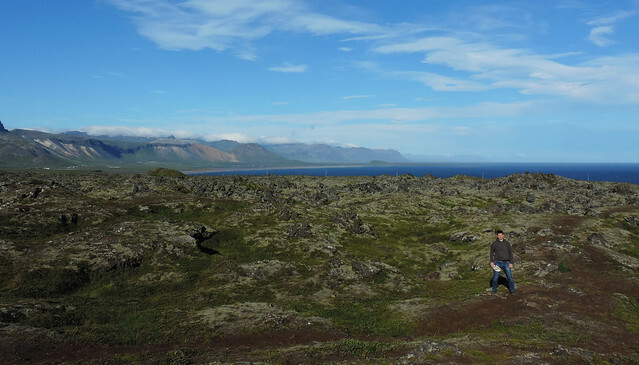 “Snæfellsnes Peninsula is Iceland in miniature” – goes the other one. Well, we started our travels in Iceland by driving around Snæfellsnes Peninsula and it certainly helped us falling in love with the country immediately. We spent 1.5 days driving through it but we could have easily spent much more time there. 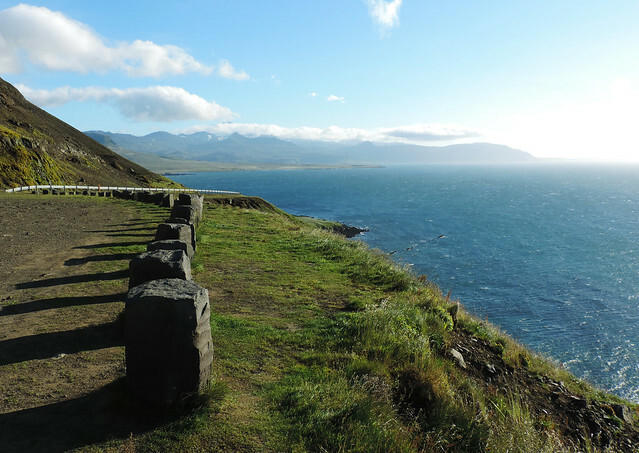 Probably we’ve seen just a fraction of the treasures of Snæfellsnes Peninsula but that’s still a lot. And a lot more than what we would have expected from such a small region. Here are our favorite stops. 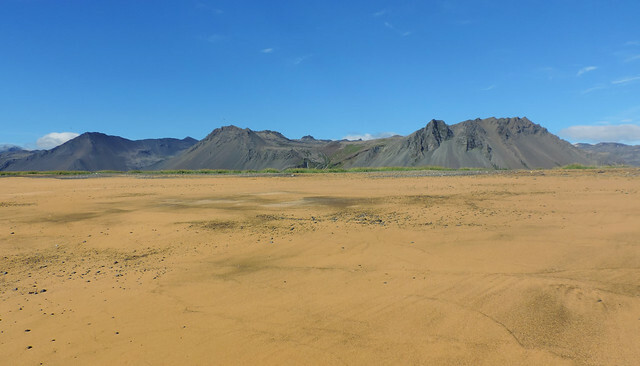 Iceland is famous for its black sand beaches. But did you know it has golden beaches with turquoise water? And with a snowcapped volcano in the background – just because it looks cool. Langaholt guesthouse is right by Road 54 and there’s a dirt parking lot next to it. The beach is only a short walk from there. Bjarnarfoss is a pretty waterfall that flushes in front of amazing basalt columns. It can be already seen from Road 54 but you need to stand right in front of it to appreciate it fully. There’s a short walking path up to the waterfall and it took about an hour for us to get there and back. 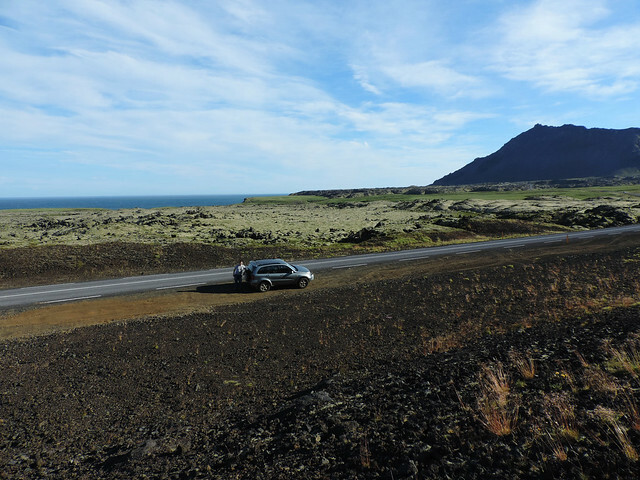 As we got closer to glacier-capped Snæfellsjökull we drove through a lava field. It’s a cool thing. 😀 The black lava rocks were covered with moss and lichen and the landscape felt more and more like another planet. Well, we were heading towards a 700,000-year-old stratovolcano. A sign by the road indicated that we entered Snæfellsjökull National Park. 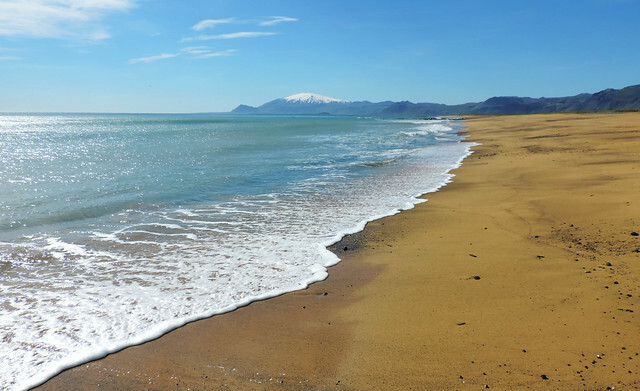 Snæfellsjökull National Park – established in 2001 – is the oldest national park in Iceland and it’s the only one that reach out into the ocean. 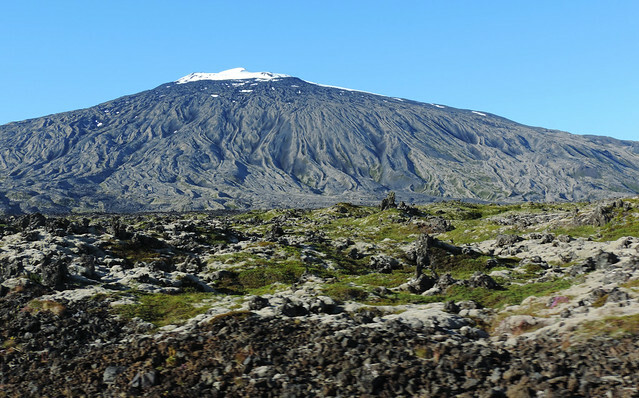 Its main attraction is Snæfellsjökull Glacier that lies on top of a 1446 meters high active volcano. We left Road 54 so that we could drive around Snæfellsjökull and have a look at this magnificent volcano from every angle. It makes the impression that the lava on its side has just flown out and congealed. In reality, its last eruption was about 1900 years ago – actually, that’s just a blink of an eye in Earth’s history. We spent the night in the charming little town of Grundarfjörður. It has narrow streets, colorful houses and a lovely little church in the centre. 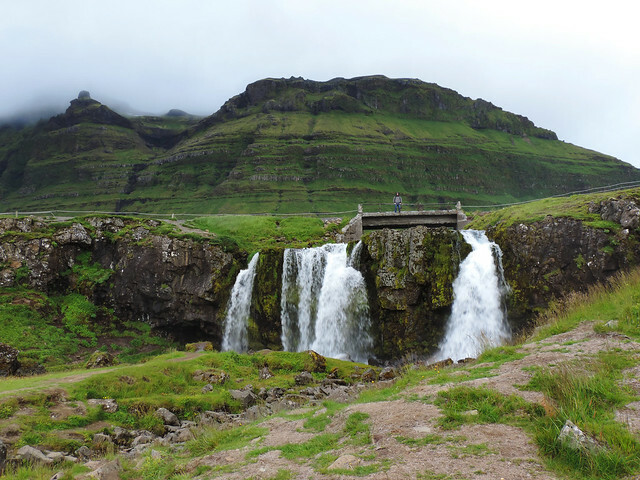 It’s located in a protected bay and just a couple of minutes drive from Mount Kirkjufell. Actually, we had a view of Kirkjufell from our window! We stayed in Grundarfjördur Hostel and it was one of our favorite accommodations in Iceland. 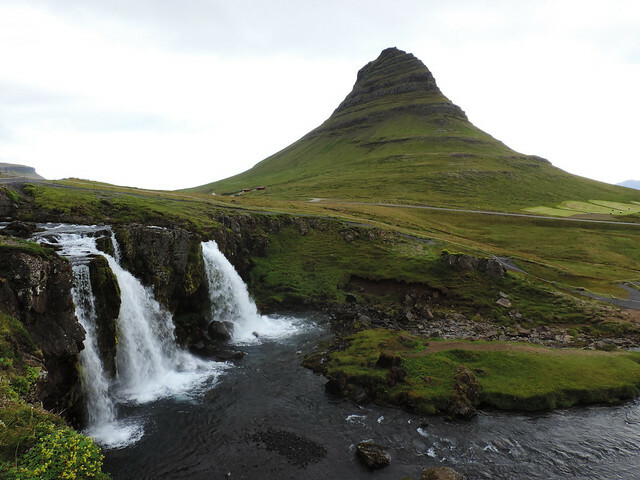 Well, having a view of Kirkjufell was certainly not bad. But we also liked our cosy room, the well-equipped kitchen and bathrooms, and the building itself was one of those lovely colorful ones. As you might suspect, we started our next day at Mount Kirkjufell. If you spend any time on Instagram or Pinterest you have most likely seen dozens of “too pretty to be true”-pictures of Mt Kirkjufell, usually with the Northern Lights dancing above. This lonely mountain by the ocean is one of the icons of Iceland. (Does it have to do anything with the fact that it’s a Game of Thrones shooting location?) While we haven’t seen the Northern Lights dancing in July, this uniquely shaped, lush green mountain is definitely pretty. 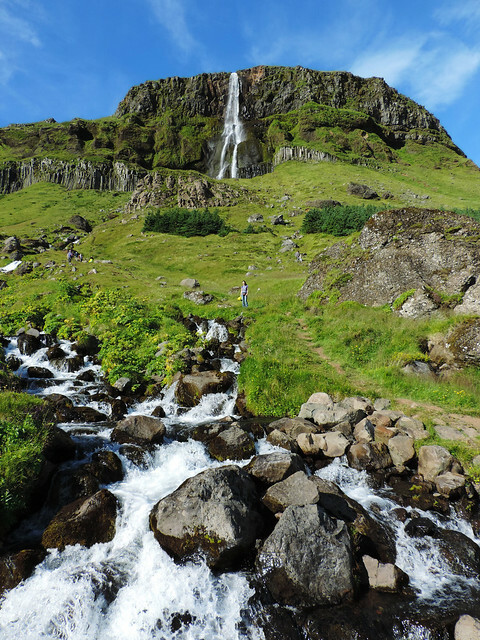 Especially with the three waterfalls (Kirkjufellsfoss) in the front. From Kirkjufell we continued on Road 54 along the ocean coast. Then we left behind Snæfellsnes Peninsula and reached the first fjord. And the next. But it’s another story for another time. Have you ever been to Iceland? Do you have a favorite scenic drive there?